I began cycling in the spring, and quickly learned two things. First, I was out of shape; second, I wanted a way to track my rides. More specifically, I wanted to record distance, time, speed and the route taken so I could see my progress over time. Ready to Ride: Tap the start button on iMapMyRide, and start peddling as the app records the distance you’ve traveled, your average pace, and your current pace, among other data points. There’s no shortage of expensive GPS devices that can handle all that. But I already own a device with GPS functionality—my iPhone. So I I scoured the App Store looking for software that fit my needs and found iMapMyRide a free download from MapMyFitness. The app tracks your rides and syncs them to the MapMyFitness Web site. 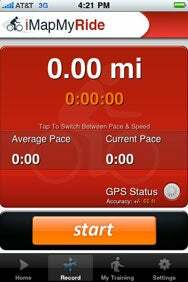 iMapMyRide also works as a partial replacement for bicycling computers, displaying data such as the time elapsed, distance covered, current speed, and your pace. iMapMyRide certainly works. I have logged more than 150 miles this month, and the application accurately recorded the various routes I took, the distance and speed. I tap the Start button, stick my iPhone in my saddle bag, and forget about it until the ride is done. When I finish my ride, I pull out my phone, tap Stop, and that’s it. iMapMyRide records the data and sends it to the Web site. Before I began using iMapMyRide, I only had a rough idea of how far and how long I rode each time I set out on my bike. Now, I have a much more accurate picture of precisely how far I’m riding and how long it takes me. That’s especially important the more I ride, as the gains get smaller and smaller and, thus, much more difficult to measure with the naked eye. When I first started riding, my times improved dramatically enough to notice on their own. Now that my time is improving by a matter of minutes, my progress has to be measured to be seen—and that’s what iMapMyRide provides. The app has a few limitations, some of which are tied to the iPhone. If you’ve started recording, you can’t switch to the phone’s iPod application to play music without stopping iMapMyRide in its tracks. Because the app uses GPS and runs during the entirety of a ride, your battery will wear down pretty quickly. Still, by turning off all other battery-draining features—Wi-Fi, push notifications, 3G, and Bluetooth—I could ride for two-and-a-half hours without trouble. I use iMapMyRide daily because it makes tracking easy. What isn’t easy is adding new rides or editing existing ones within the My Training tab. It should be a simple matter to change a ride’s duration or adjust the start and end time; it isn’t. The application doesn’t use the conventional scroll wheel interface for adding time data, presumably because the workout section of the app is just a web view. Each time element (hour, minute, second) is a separate drop down, so it’s more cumbersome than necessary to enter a time. Worse, after inputting the start and end times, the application doesn’t calculate the duration correctly, turning what should be a one hour ride into a two hour ride. It hasn’t worked correctly a single time since I began using it. Rather than edit the time on the iPhone, I just sync iMapMyRide with incorrect data and edit it on the Web site instead. That’s a backward way of doing things that’s crying out for a correction. I hope that MapMyFitness tackles the My Training tab, because as excellent as iMapMyRide’s recording feature is, its method of editing and viewing past workouts is really poor. The app shows a lot of promise, but there is a lot to work on. iMapMyRide is compatible with any iPhone 3G or 3GS running the iPhone 2.1 software update.